I have more shiny stuff to post when I get a chance to resize them. The website does not like 4000 pixel images. Heh. Ended up pulling the jugs anyway. Looks like the studs are rusted bad, guess they'll get replaced. Cylinder bores have been honed. Piston and rings look good, just gonna clean them up. Wrist pins were tight so going to re-install with new clips. Starter needs a major cleaning and new seals. Paint is curing on the body, still have the caps to do. Brushes are in really good shape to be as old as it is. The wire wheel on the drill press makes quick work of metal cleaning, ready for paint. 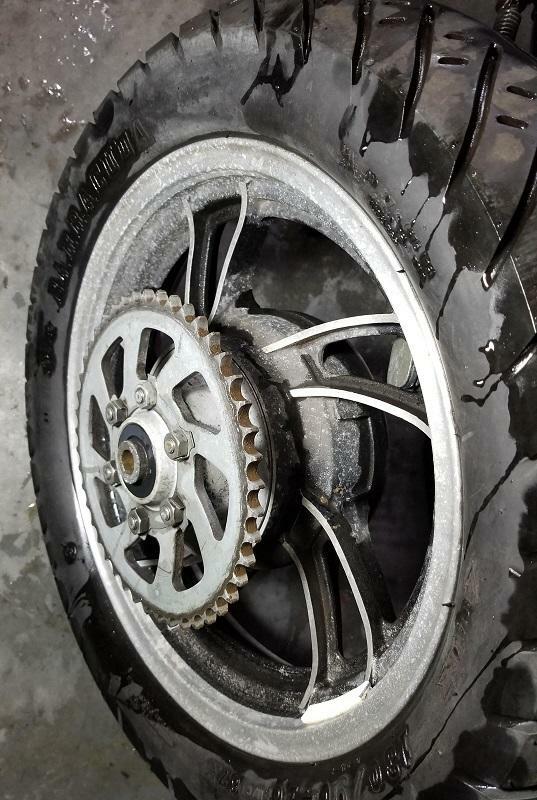 That's one ugly sprocket cover! 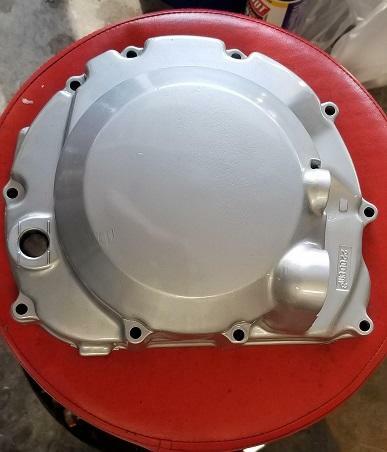 Finish pics of the starter and clutch cover soon. Waiting on more parts. Thanks. Got more pics coming up. Working on rear rim, starter and frame re-assembly. Still trying to locate a single bs29 carb for the rack to replace #4 body. Found a full rack in the US for $200 but was hoping to not have to buy a whole carb set. Engine case is getting painted soon and I'll re-assemble the top-end. Thanks! 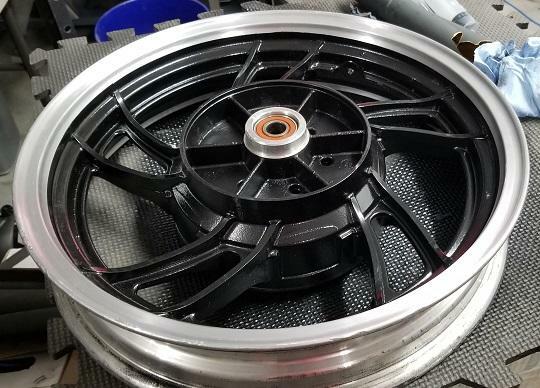 Yes, it's a 16" rear 19" front. Finding the front and rear aspect ratio in those from the same tire series was fun. I ended up going with a Continental Go! road tire for now. I expect I'll be wanted a larger model bike once I get this one done. I'm a noob rider so I'm learning the bike from the frame up as I restore this one. I like to learn things from the inside out. So far, I like Yamaha's engineering choices. I suspect Honda is similar. To have 18k miles and been around for 35 years OE parts have held up extremely well. The rear rim is done. Lots of cleaning, sanding and buffing with steel wool. Got a bit of rash on the outer lip but it's 35 years old. Not perfect but it'll do. I wish I could take the time to grind the paint off the spoke faces but I have so much else to do. I might do it later if I have a break in parts arrivals. The engine still has no cylinders, waiting on studs. I used wet and dry to dress the edges. glad you didn't make the same mistake as I did and got it sandblasted. took me hours to dress and polish the wheels. Eek. Sand blasting would be a cool effect if you want a matt finish but it would definitely remove the casting texture. I imagine the sanding took a while as it did with the oxidization on this one. The clear on the polished lip refused to level out properly. I may end up re-doing it, dunno yet. At this point I can't afford to get stuff coated or rechromed. The gauge housings I have are either cracked or have major road rash and the visible bits have some rust or pitting. So, it won't be the mint restore I want. What I can do with it will be what it is. Plus, the bike value is only $250 for insurance and I've far surpassed that already. The signal bits have been polished and new stems installed. These are all-original but 3 of the 4 lenses have broken-off screw channels. The replacement O-ring # I ordered is too small for these. Not sure what's going on with that. Need to verify the lens and body numbers against the book. The replacement gas tank finally arrived and it's dent-free! Woo! Light rust and some graffiti are no issue at all. POR-15 3-step process is first for the tank. It will likely outlast the frame after this. The spare seat under the tank was supposed to be a clean replacement and apparently the mid-seat seam split. I put conditioner on it and it was gone the next day so I think one of the kids may have been involved. Oh well, good to know now so I can order a skin for whichever seat foam is best. This is just great dude, I'm lovin' this! Tail lenses polished out nicely as well as the turn. No need to buy new ones. Swing arm, wiring and boxes are back on. I also added the refreshed rear peg mounts and brackets. The LH side is back on. Right side rubber is soaking in a mix of synthetic power steering and regular brake fluids. It'll go on tonight. The fuse box on the donor harness was in decent shape. Used some Lemi-Shine to clean off the oxidization then sealed the paper labels with clear lacquer. Have to source one replacement fuse clip to complete the box. Working on this spin-on filter adapter housing design. A few more design changes to make after 3D printing fitment tests. Then a colleague of mine will mill it for me. 6061 aluminum for everything but the filter pipe. Not sure if I'll paint it, polish it or have it anodized yet..
shouldn't need to make one, I used an FZR400 spin on adapter for the FZ, I use spin on filters with out getting mucky. I know I can get a basic plate adapter. I want to make a custom one for my bike with a cover. I may put the Yamaha logo on it, not sure yet. The donor tank is getting some attention now. No leaks or dents. Boy did I luck out with this one! The POR-15 kit is complete but I've actually had better luck with Evapo-Rust and Super Clean for removing surface rust on steel. The wire wheel works best but for something this big and oddly shaped I can't get the wheel in all the edges and corners. Next time, I will just buy a quart of tank sealer and remove the rust with a full tank dip in Evapo-Rust after degreasing it. The outside needs a good sanding and primer coat now. The inside is pretty spotless. I just saw a couple of 4-5mm spots on the bottom right of the saddle. I'll let the sealant take care of that. Video of the process coming soon. I'll be coating it tonight and waiting for it to cure before I finish the video. Unfortunately, that is not a tank for the XJ550. Very close but it's too long and the tunnel is the wrong shape. Ugh.. waste of sealer.